?1000 + Yr Old India Cholas Rajaraja Octopus Man 1 Massa Copper Coin. Believed to have been minted sometime from 985 to 1014 AD. Due to this coin being obtained from sources in India who say they found this coin in digs there, it is impossible to guarantee its authenticity. However, the coin does match reliable descriptions of coins from the Cholas era.
? 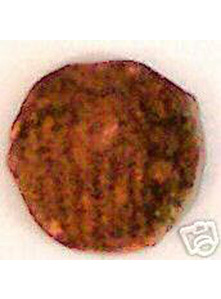 1000 + year old coin you receive may differ in appearance from that shown in photo but will be in same general condition. This is supposedly a circulated coin from over 1000 years ago! ?985 to 1014 AD India Medieval Cholas Octopus Man 1 Rajaraja 1 Massa Copper Coin. The Medieval Cholas Kingdom rose to prominence when King Vijayalaya defeated the Pallavas and captured Thanjavur. The greatest kings among the Medieval Cholas were Rajaraja Chola I (reigned 985-1014) and his son Rajendra Chola I(reigned 1014-42). Under them, Chola power reached its zenith. The Rajaraja conquered Kerala and a part of Ceylon (Sri Lanka). The Chola Kingdom supported a flourishing social and economic life, marked by a flowering of Dravidian culture. Cholas were great patrons of literature, philosophy, art and architecture. Raja Raja I was responsible for construction of magnificent temple at Tanjore. This temple, which is dedicated to Lord Shiva (also called Bruhadishwara) is a masterpiece of architecture. It is built out of the red sandstones with large number of sculptures carved outside and inside involving immense labour and infinite pain. Chola art is characterised by a massive grandeur truly reflected in this massive temple which consists of great `Shikhara’ of fourteen stories, crowned by massive dome carved out of a single stone which weighs probably 100 tons!!! It is believed that to install this dome on the temple (which is of 190 feet height), a ramp of 5 miles was constructed. A famous historian Fergusson has written `Chola artists conceived like giants and finished like jewellers’. The emblem of the Chola empire was the tiger, which was featured on the Chola flag, on some coins(not this one), and in other contexts of political significance. One side of this coin shows King Rajaraja standing; it seems like he has 6 legs, looking like an octopus, giving this coin the popular name of “octopus man” coins. The other side shows the seated king enthroned. Diameter of this coin is 17 mm. Coin you receive may be somewhat darker or lighter and may show somewhat more or less detail than shown in photos. 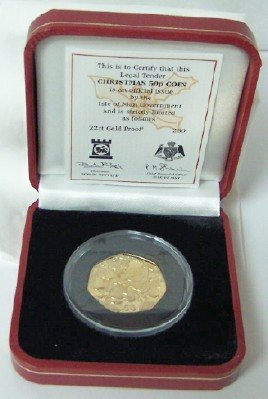 This ?ancient coin makes a great collectible gift for yourself and/or someone you know.